I’ve always been passionate about food and have a huge collection of recipes, not to mention an unpublished cook book, so I thought it was time to share my culinary thoughts with anyone who might be interested. Given the number of great food blogs I’ve seen online, starting my own is somewhat daunting, but here goes. The name Cafe Cat comes from my nickname within the family of Cat or Mrs Cat. I can’t remember how I ended up with with this name, but somehow it stuck. I grew up in England in the 60s, when olive oil was kept in the medicine cabinet as a cure for earache and only foreigners ate garlic. We had never heard of eggplants or zucchini, not even by their European names of aubergines and courgettes. My mother was brought up in Malta during the Second World War and because of rationing she wasn’t allowed to cook in case she ruined anything. When she married my father she couldn’t boil an egg. Fortunately my paternal grandmother took her in hand and taught her to make a few easy dishes to keep body and soul together, otherwise we might have starved. Like most families back then we ate simple British fare – meat and two veg, fish on Fridays and ham salad on Saturdays. Vegetables were limited to Brussels sprouts, cabbage, cauliflower, carrots and turnips, with beans and peas making an appearance in the warmer months. Potatoes featured at almost every main meal, in one form or another. Lunch was called dinner, dinner was called tea and everything was washed down with copious quantities of tea. Fortunately my father ran his own nursery, so we always had plenty of fresh tomatoes and cucumbers. Weekly cooking classes were compulsory at high school so by the time I left I had covered all the basic skills and traditional British recipes. Preferring to spend her time gardening, my mother gave lots of encouragement, although I remember my first attempt at bread rolls – even the chickens refused to eat them. In my early teens we spent our summer holidays on a dairy farm in the north of England, where my Dad’s father had grown up. Hill House is located on the heather-covered moors of County Durham and we thought it was paradise. Several times a day the farm workers came in for a meal, leaving their muddy boots outside and sitting with their stockinged feet under the kitchen table. They were always eating – toast and marmalade before milking, a full cooked breakfast afterwards, morning tea, a cooked lunch, afternoon tea and supper after the evening milking, at around nine. Even the postman came in for morning tea and on Sundays other members of the Hutchinson clan came round for afternoon tea. The table groaned under the weight of all the delicious homemade cakes and pies. I had never seen anything like it. Keeping up with this huge demand for sustenance was no mean feat. One day a week was set aside for baking and Great Auntie Vina was happy to let me cook until I dropped. She never said stop, that’s enough, as my mother sometimes did. I have fond memories of those holidays cooking, eating and writing out recipes. Horse riding and helping with the milking and hay-making were also on the agenda, so I didn’t spend the whole time slaving over the wood-fired Aga. My first trip to France was a real eye opener. I went on a school exchange and stayed with a family near Valenciennes in the industrial north. In three weeks I discovered coffee that wasn’t instant, bread that wasn’t pre-sliced, cheese that wasn’t cheddar and salad that wasn’t dressed with Heinz salad cream. I also learnt to drink wine with a meal, ate my first croissants and helped to fill bottles with water from a natural spring in the village square. When Martine’s parents discovered I had never eaten snails, we were sent off after a heavy downpour to collect some from the hedgerows. We returned with several dozen and put them in a special enclosure in the garden to spend a few days eating bran to clean out their systems. They were then boiled until tender, filled with liberal amounts of garlic butter and baked in the oven. Served with a crusty baguette and a green salad they were delicious. For dessert I made an English apple pie which also went down a treat. Three weeks in France did wonders for my French and put me amongst those considered good enough to study another language. I chose Spanish and the following year went on another school exchange to a small village in the Basque country, near Bilbao. There I learnt to cook with olive oil and was introduced to a whole new array of culinary delights – grilled sardines, chick peas served warm with olive oil and fried garlic, cod baked with a delicious tomato sauce, Spanish omelette, squid and octopus in various shapes and forms. And of course lots of wine which in those days cost a peseta a glass in the bars, where an amazing selection of tapas was displayed. I went back three years in a row. In 1970 I joined the Foreign Office and after a year in London set off on my first overseas posting. For anyone who appreciates good food, living in Geneva is like being a dog between four trees. Switzerland was expensive, but it’s right next to the border with France, where prices were more moderate. One of my work colleagues had a copy of the Michelin Guide and spent hours choosing one-star restaurants within a hundred kilometres. A gang of us would head off each Sunday for a leisurely six or eight course lunch. In 1975 I married Matthew, an Australian diplomat, resigned from the Foreign Office and moved to Australia. We arrived in Canberra on a cold, blustery morning in early June in a Fokker Friendship. As I walked up to the prefabricated building which served as an airport lounge in those days I couldn’t believe I was in a capital city. From a culinary point of view Canberra was nothing to write home about either. I will never forget one of our first meals in a restaurant where we both ordered steak. “Wouldn’t you like to know how we’d like them cooked?” Matthew enquired. “You can tell me if you like” replied the bored waitress, “but it won’t make any difference”. And she was right. Fortunately Canberra has come a long way since then. A posting to Tel Aviv added some Middle Eastern recipes to my collection, such as Baba Ganoush and Hummus. Then after a six year stint back in Canberra we went to Kuala Lumpur, where I bought a huge black wok, which I still use. While based in Malaysia we travelled to Thailand, Vietnam and Singapore and I spent many happy hours wandering around food markets and attending cooking classes. From Malaysia we were crossed-posted to Pretoria, the capital of South Africa. The timing was perfect for skiing so we managed to squeeze a three month holiday, from January to March, in between. We rented a chalet in France, on the outskirts of the picturesque village of Megeve. We played “schools” with the kids who were 11, 8 and 5 each morning, so they wouldn’t get behind. In the afternoons we mostly skied, except for the week when we were snowed in. We also skated, watched husky dog trials and the kids built an impressive igloo in our snow-covered garden, from large chunks of ice which had fallen off the roof. There were lots of opportunities for cheese fondues and lunch each day was built around a couple of baguettes and a selection of cheeses and pates from the local epicerie. The kids had never skied before, but by the time we left they skied like demons and left us behind. During our two years in Pretoria we travelled quite extensively in South Africa, visiting game parks, beaches and wineries. We also managed to visit Zimbabwe, Lesotho – where we pony trekked in the mountains for 5 days – and Swaziland – where we attended the King’s 21st birthday party, an amazing experience. On the culinary front I didn’t learn any new tricks, but apartheid still had a firm grip while we were there – Mandela was released just after we left – so the food we were exposed to was Afrikaans in style and fairly Western, with lots of barbecues. After another stint back home, Matthew was appointed Ambassador to Chile in 1992. At last, a posting where I could speak the language! I had recently completed a diploma in journalism and soon found a part time job as food writer for the English newspaper, with my own weekly column called The Good Life. Chilean food at that time was going through a similar revolution as Australia in the 1970s – trying to find its identity. As a food writer I was invited to become a member of The Circle of Gastronomic Writers of Chile whose members were the Jamie Olivers of Chile, so to speak. This automatically put me onto the list of national food judges and critics. For the four years we lived in Santiago I was in seventh heaven. Matthew was concurrently Ambassador to Bolivia and Peru and we travelled extensively in the region. Another stint in Canberra and we were off to Paris, the city of light, not to mention food. We ate in some fabulous restaurants, travelled extensively and saw in the new century from the balcony of our apartment right next to the Eiffel Tower. 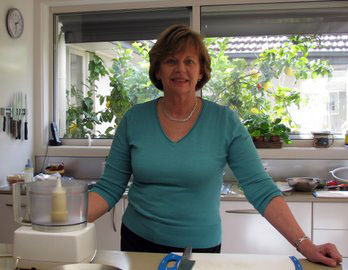 One of the culinary highlights of our stay was when Maggie Beer came to cook for a big event. They were looking for someone to help her in the kitchen, so of course I put up my hand. The occasion was the bicentenary of the French navigator Nicolas Baudin’s arrival in South Australia and the food and wine was air-freighted from Adelaide to Paris. A huge fresh tuna turned up in a box the size of a coffin. Fortunately we found a fishmonger in the local markets to cut it into more manageable pieces. Our last posting was Copenhagen where we arrived two days before the engagement of Danish Crown Prince Frederik and Mary Donaldson. We attended all the events leading up to and including their wedding in May 2004 which was a truly amazing experience. A week before the wedding the Governor General of Australia, Michael Jeffery and his wife Marlena, hosted a gala dinner for the Danish royal family, Mary’s parents and a few select guests. We arranged for the wine, food and flowers to be flown in from Australia, accompanied by chef Luke Mangan. He produced a stunning meal and everyone was suitably impressed. Diplomacy, I soon discovered, involves a lot of cooking. With several events to host each week, from small dinners to large receptions, being an ambassador’s wife is a bit like running a restaurant. Apart from Copenhagen – where we had a wonderful chef called Christian who came in to help when we entertained – I’ve always had well-meaning but largely unskilled helpers in the kitchen. So over the years I’ve developed a repertoire of recipes where most of the preparation can be done beforehand. Once the guests arrive, I want to be out there enjoying the party, not stuck in the kitchen. I began collecting recipes when I was at school. Some of the recipes in my large collection have been in my family for generations, others were passed on by friends and chefs around the world. Many have been adapted over the years to make them lighter or update their presentation. I’ve served them to royalty, PMs and other VIPs and there have been no complaints. I hope you are inspired to make some of them. At this stage I have not received any payment for anything which has appeared on this blog which does not, at this stage, carry any advertisements.